The long-gestating film project is not going to wind up on the big screen, but instead will be a series on Hulu. On the positive side, this means that they'll have the time to focus on the building of the 1893 World's Columbian Exposition in Chicago, where I expect the movie would skimp on that to concentrate on the story of the serial killer H.H. Holmes. But on the negative side, it's going to be a TV show. And it's going to be on one of the more useless pay channels. Mr. H, GodShifter, longdist01 and 1 other person like this. This is going to be on Hulu though. If it was $1 an episode, I might consider it. That's what I expected too. I have no interest in the murders, but for some reason am fascinated by old world's fairs and amusement parks. Yeah, I found myself skimming over the parts about Holmes, fascinated by the fair and how it was coming together. I just want to see that world. Chicago is my home, and the sheer scale of the thing is amazing. I found this interactive map that allows you to scroll back and forth between a map of the fair and modern Chicago. On its 125th birthday, what's still left from the 1893 World's Fair in Chicago? jojopuppyfish and Matt Richardson like this. I just finished reading the book. The description of the fair and its social impact is fascinating. The Holmes part certainly is macabre. The Toronto connection was interesting to me. I'm sure they're going to skip the building the World's Fair part and go straight to the bludgeoning. Hey, it's a movie. There have always been serial killers. There has only been one White City. GodShifter, longdist01 and Ghostworld like this. Well, it ain't called "White City and the Devil." Lol. Holmes was worse than Hannibal Lecter in some ways - baking a woman to death, for example. They've been trying for years, and no studio wanted to come up with the budget needed to realize the White City. There is a hole between a ten million dollar budget and a hundred million dollar one for theatrical release. Computer graphics have gotten cheaper, but it's still a huge amount of labor. 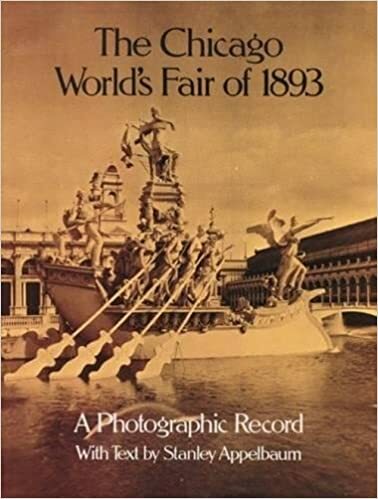 If you are interested in the World's Colombian Exposition of 1893, you should get the book The Chicago World's Fair of 1893 - A Photographic Record. The 100 page paper back book is chock-block full of great photos on every page as well as great text. Text is by Stanley Appelbaum and photos from the collections of Avery Library of Columbia University and The Chicago Historical Society. It is available from Amazon for about $15, as are about 4 or 5 other books about the fair and White City. And The Devil in the White City is a creepy story, but a very interesting and compelling one. I've got that one at home in my library! Seconded! My one disappointment in The Devil in the White City was the lack of anything significant about Tesla and Westinghouse lighting the whole place up. It was electricity's "coming out party." dewey02 and longdist01 like this. I'd hope so. Vickie is even more annoyed than I am, because we both have been waiting for this for a very long time. We wanted to see the magnificence of the White City on a 30 ft wide movie screen. She really doesn't want to watch anything other than in the theater these days. Literally the only television program she watches in any given year are the Golden Globes and the Oscars. maybe someday they will have a special showing...never know. The long-gestating film project is not going to wind up on the big screen, but instead will be a series on Hulu. On the positive side, this means that they'll have the time to focus on the building of the 1893 World's Columbian Exposition in Chicago, where I expect the movie would skimp on that to concentrate on the story of the serial killer H.H. Holmes. That is such a weird, weird, weird story. Did you see on the recent NBC series Timeless, they made a stab at telling this story as a 1-hour episode. No I didn't but again I expect they probably really concentrated on the serial killer who managed to build a "murder hotel" equipped with a crematorium. Stinks that this will be on Hulu. I don't think Hulu is any more or less useless than any other streaming service but I understand your disappointment that it won't make it to theaters. Unfortunately, this is going to become more common going forward. Perhaps it will lead to people starting co-op or community movie theaters with large screen projection like shared space projects (if the legal rights issues can be worked out of course).